As we come to the end of the year, let me say a big thank you to everyone for their help and support of the school this year. There are too many names to mention them individually, but I would like to specifically thank those in the PTA for their help. As always, there are many farewells to say, to the students who are moving on to other schools and countries, to the families going with them, and to the teachers who are heading to new roles in other schools. Please join us at the end of year assembly at 8:30am on Thursday to help us say good bye to all of them. Students are free to leave school after that assembly. After the assembly we will have the parent-teacher conferences from 10:35am to 12 noon. We hope that students and parents will join us then. Reports for all students up to M4 and for D1 students will be issued on ManageBac on Wednesday, 13th June. Please use your regular login details to access your child’s report. If you need help please contact Grace for new login details. I wish you all a safe and happy holiday and look forward to seeing most of you for the start of school on August 13th. We would like to say goodbye to all of our leaving teachers. They will be missed. Kate Schermbrucker has served as a Primary Teacher, PYP Coordinator and Head of Primary during her 4 years here. She will be leaving Tanzania to head to Kristiansand Norway to teach the PYP. Kate has worked extremely hard to promote the interests of the youngest children in our school. She has been a keep supporter of primary clubs and sports and is looking forward to seeing the Community Garden in a few years. Rick Fitzpatrick has been here 8 years teaching History and serving as the Diploma Coordinator. He will be heading to Namibia with Mary, Chris, Dominic and Gabriel. Rick is a tennis enthusiast and has been instrumental in organizing the tennis tournaments at Ameg. I know that he will be missed by the scores of DP students that he has shepherded through these halls. Joe Wright has been here 18 years, coming to Moshi in 2000. He has served as an English and TOK teacher, Head of Department and chair of the CIS accreditation team. He will be heading to Bangkok with Vera, Joanna and Eddie. In his time here, Joe has taught English to hundreds of kids and will be known for instilling his love of literature in his students. Jocelyn Sulivan has spent 4 years at ISM. During this time, she served as the Kiongozi boarding parent for 3 and taught EAL and English. She will be heading to Angola with Ryan, Niall and Effe. Jocelyn is warm and approachable and figure of reassurance and support for many of our students. Doreen Ogello will be heading back to London with Alex after 3 years in Moshi teaching Chemistry and ESS. In addition to teaching, she has done a great job of leading the student council. We are especially sad that she is leaving now as we will have the 24-hour run next year and as one of our committed distance runners her services would have been much in demand! Jonathan and Julie Bowen will be going to Bratislava Slovakia with Luke and Ella after 2 years here in Moshi, and 4 years in Tanzania. Jon has been out Physics teacher and Head of Math & Science and outside of class, taught tennis the last two years. Julie has been a driving force in primary technology and will always be remembered for her creativity and out of the box thinking. Scott and Clare Hibbard are heading to Dubai with Grace. In their two years here, Scott has been the Head of Sport and Clare the P 2/3 teacher. Scott is keenly passionate about sportsmanship and worked hard to improve the quality of our sports fields. Clare has been my younger son’s class teacher for 2 years, so I know firsthand what a wonderful job she does. Anil Joota has spent two quiet years in Moshi and will be trading that in for the bustle of Shanghai where he will continue to teach design. He will be going with Hope, Aditi and Isa. Anil has been very involved in OP and as I write this he is on Kilimanjaro with some of our students attempting to make the summit. He has also contributed to our sport and club programs. Delali Ocloo is one of two staff members heading to Angola. Over the last two years Delali has been a major factor in our MYP as the boys’ boarding parent and math teacher. He will also be remembered as the arm wrestling champion in last semester’s fun fair and for his chess skills. 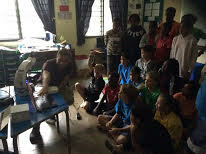 Erica Wilsen will be heading back to Massachusetts with Luke where she will rejoin her previous school and be reunited with Andy and Aiden after 2 years of teaching math in Moshi. She works tirelessly with her students and helped the D2 students plan their end of year activities. Eva Toth-Nagy, our Head of Learning Support, is heading to Hungary with Lili and Benji to rejoin her family. She hopes to remain in international teaching. Eva has been a strong advocate for the children in her care. Outside of class, she has been involved in primary clubs such as cooking, gardening and yoga. 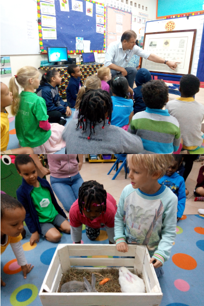 This week D1 students participated in two engaging events. First, D1 Biology, Chemistry and Physics students collaboratively worked on their Group 4 projects while D1 ESS students engaged in practical research on species in the school garden. Secondly, on Friday they participated in the first of three school days of another carefully designed event – the Theory of Knowledge Symposium (see photo). The end-of-year assembly and final parent-teacher conference of the academic year are two vital reasons to visit ISM on Thursday June 15. The June/July break provides a crucial opportunity to work on the Extended Essay and coursework in DP subjects. Parents would do us huge service if gentle pressure were placed on students to focus on these during the break. Kindly ensure your son/daughter returns punctually for the start of the 2018-2019 school year on Monday August 13. Enjoy the long holiday with your son/daughter. We are thankful for the parents’ support this year. We have continued to make strides in MYP that we hope to build upon in the coming years. Teachers verified the alignment of MYP subject content and skills coherently with the DP in all year groups. We have reoriented the MYP focus days to service in the community and look forward to introducing student led conferences in Quarter 3 next year. We shall continue strengthening the service component in MYP while paying attention to the key skills of communication, collaboration, organisation, research, thinking and transfer. The MYP students began their community service activities on Friday June 8. This will continue on Monday June 11 and Tuesday June 12. 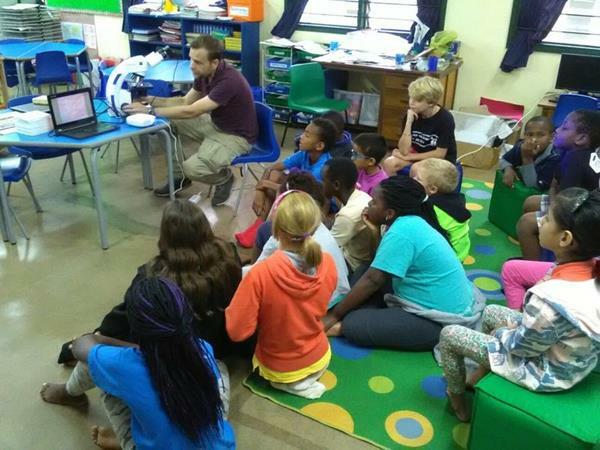 M1-2 students are in the school’s day Care Centre, M3 are at Kili Centre while M4 students are with Upendo Orphanage. They will present their experiences on Tuesday June 12 in K-Hall as from 10:35am. Parents/guardians are welcome. The M4 examination results are currently being processed and will be sent on a separate report before Wednesday June 13. 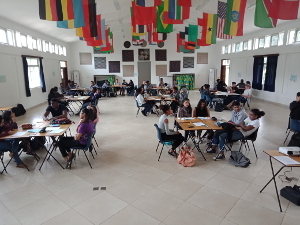 Students have concluded making choices for their various language, arts and mathematics courses for next academic year. We want to thank parents for their guidance in this exercise. The results will be available as from Monday August 6, 2018. The French reading books are now very well organised, thanks to an industrious team of volunteers. 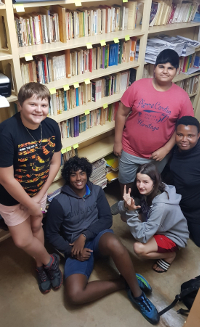 Thank you to Remy, Mathias, Audrey, John and Darsh for the sorting and to Mr Masawe for the spring clean! If any student would like to borrow a reading book in French, they are welcome. See Mme Webb for further information. This will be the last weekend of this year. School closes on Thursday 14th June, and will reopen on Sunday 12th August for boarders. Boarders should plan to leave on Thursday and if you have not shared with us transport details for next week, particularly those using flights, we need that information now, so we are able to plan transport. Kindly inform us if your child will need transport to and from the airport. Kindly note that it is not possible for the school to provide transport to Arusha airport. All boarders are required to update the school with medical information when they return in August for the next school year. This information can be provided in a prescribed medical form that can be downloaded from our website. Parents are reminded to fill this form and send it to us if they have not already done so. As we wrap up this school year, if any student has any equipment or ISM sport uniform please take the time this coming week to return it to the PE Office before you leave for the summer. Wednesday June 13th will be the final Inter-house Sports Day of the year. The competition for overall house champion is close! A schedule has been sent to all students by email. ISM will host a secondary event in each one of the first three seasons; two primary events; a primary and secondary swimming gala; and our sports weekend. This is good news for our sporting program. Reminder: Please return all reading books, library books, library bags and other school items. Reminder: Please take home all indoor shoes, water bottles, hats, personal pencil cases and bags over the holidays. Monday 11th June: No homework to be set this week. Children should continue to read each afternoon/evening. Tuesday 12th June: Final day of Primary Clubs. Wednesday 13th June: Primary children go home at 1.05pm. Bring extra bags to school to carry home portfolios and other work books etc. Thursday 14th June: Children go home at 10.15am. I would like to take this opportunity to thank all the children, teachers, teaching assistants, parents, school leaders, support and ancillary staff who, together, make up the amazing ISM community. You have made my four years in Moshi incredibly special (life changing). I have learned so much in my time here. I am now moving on to pastures new (Kristiansand International School in Norway) where I will be a PYP class teacher. It has been an honour to work as a class teacher, PYP Coordinator and Head of Primary at ISM. It is no wonder, that when I attend international school conferences and workshops, the ISM name is well known and thought of fondly. I look forward to hearing all about the school’s ongoing progress and hopefully its new status as a United World College. 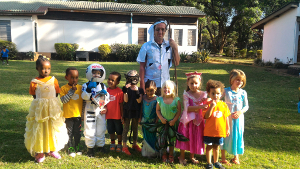 I wish the Primary children (past and present) all the very best for their future studies, careers and adventures. The children have been preparing for our end of unit story telling morning. Please join us this Wednesday at 10.30. We took advantage of this weeks ‘biblical swarm’ of grasshoppers to collect, inspect and race these interesting insects. Thanks also to Mama Eefke for visiting us with two rabbits on Friday. The children received a lovely gift from P4 of a huge cardboard playhouse. All books will be collected this week, so please be sure to send any in along with the childrens bookbags. We hope to see you at our final assembly on Thursday. I would like to take this chance to thank you all for your support this year. We’ve modelled our own bio-engineered and bioluminescent creations, made some beautiful artworks, been visited by cavemen, shared fantastic books and stories, produced recycled planters and worked hard in our little garden. We’ve raised money for a good cause and learned a lot about independence, communication and self-reliance. We’ve played our hearts out, found ways to negotiate our wants and needs and have begun to stand on our own feet as individuals. The local and wider world has been explored as we began from our own individual experience and began to expand our worlds beyond just the self. Our oldest children have been guided through their very first steps in reading and writing and our youngest have begun to understand what it means to be a member of a classroom community. We have been reflecting on our journeys this week. Family trees can tell a lot of stories. The children shared their family trees with one another, talking about their family members. Thank you Baba Jasmijn for coming to share your family tree with us on Wednesday. The children were amazed at Mr. Evert’s family tree that spanned about three generations. They asked him such insightful questions and were inspired to ask more questions about their own family trees at home. We welcome you all to our presentations Monday morning as you drop off your children. Please take time to ask us questions about our journeys and the information we have collected. In mathematics, we looked at what fractions of shapes and numbers are, how to write them and how to add simple fractions. I wish you all a very wonderful, restful and peaceful holiday. Hope to see you next school year! This week the P2/3 children have been enthusiastically writing. They have been playing Math games and working on cooperation. Next week their will be no homework and reading books will be collected on Monday. On Wednesday please can you send in an extra bag for your children`s class work. Tuesday will be the last day of clubs. Please collect your child at 1:05 on Wednesday. Thursday we will have a little farewell party. Please can you bring in a snack to share with about five people, (cakes, fruit, juice etc). I would like to take this opportunity to wish you all a wonderful holiday. Thank you for the support over the past two years. I have enjoyed working with you and teaching your children. ISM and Tanzania will always hold a special place in my heart. 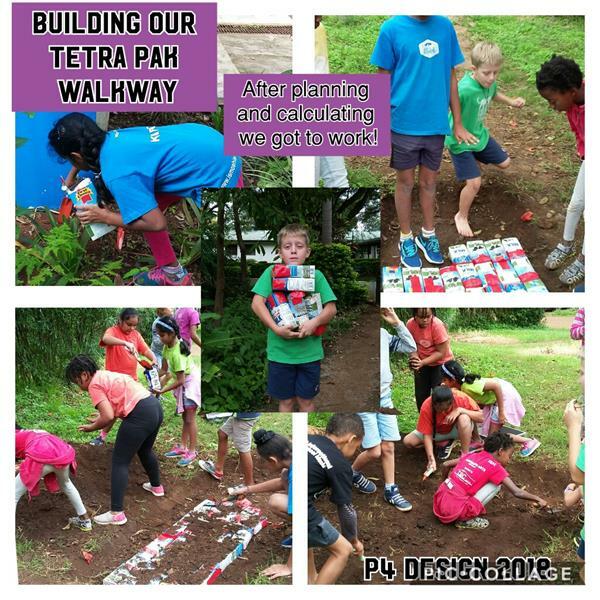 This week, we have built our Tetra Pak walkway in the community garden. Be sure to ask your child to take you to the garden and explain how and why we made this structure. We will hopefully get a chance to put the final aesthetic touches on it next week. Our recent treehouse prototyping project and our bridge models made us realize that structural support is really important. In response to this, on Wednesday, we will build wafer/biscuit towers on different surfaces (jello/rice krispie bases) to further explore the structural elements of design in engineering. Lastly, as we have been focusing on kindness in our classroom and in response to our (hopeful) achievement of 100 acts of Kindness, we will be having a party on Thursday morning. Please send in any snacks, plates/cups, drinks that you would like your child to share. As this the last newsletter of the year and my last year at ISM, I want to thank Kate and the parents for all their support during the wonderful two years I had teaching at ISM. I will miss you all! the children back at school on Monday, 13th August. The P6s have had a great year and did us proud in the various activities they participated in, during the year. I would like to thank all of you P6 parents for your continued support. It is a bittersweet moment for all of us in P6 because in as much as the move up to Secondary is exciting for the students, losing some of the students is hard. We wish all families moving from ISM the very best. Monday: Kindly ensure that all library books are returned to school. There will be no homework and clubs will run until Tuesday. Wednesday: We would also like to have a small class party on Wednesday, before the 10 o’clock break as a way of celebrating our year together. We ask that you send your child with snacks to share. Thursday: You are welcome to our final assembly on Thursday at 8:30 a.m. in K-Hall. I wish you all happy holidays and to the muslim families, Eid Mubarak.